Supplies needed. The beautiful cards were done by Debra and part of her SoulCards II deck. I found this expressive art modality in 2003 and soon held workshops. It's a simple yet profund way to assist in the healing process. It gives us permission to just be and freely scribble outside the line! Used in healing centers, psychiatric centers,hospitals etc., has helped people bring to the conscious level deep seated traumas and issues including physical illnesses. I think this art process coupled with HeartMath training would be more wonderful tools to add in the healing process. Not to mention its just plain fun! The hardest part is allowing oneself to let go and allow the flow of the inner self. 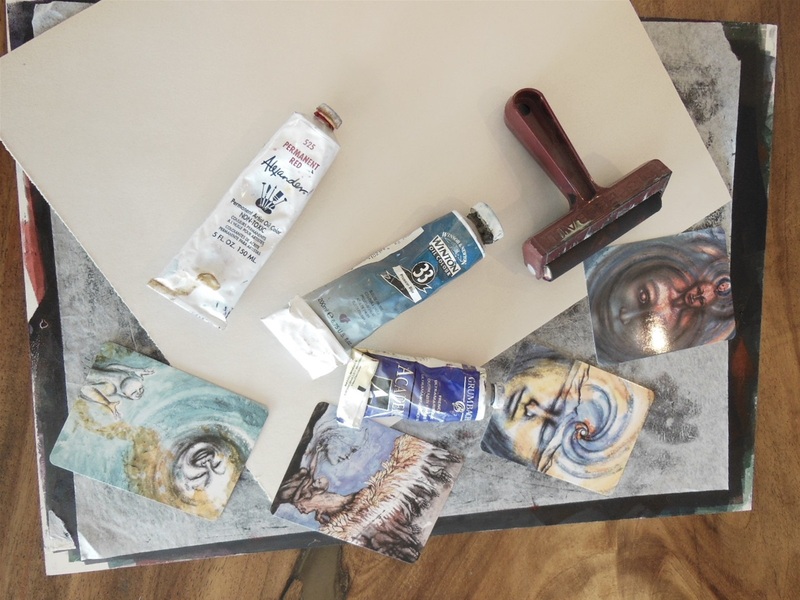 Supplies Needed All you need in this workshop is a couple tubes of oil paint, a paint roller (brayer), a clayboard or any surface you can roll paint on smoothly, tissue paper and newsprint paper.